I’m convinced that it’s the small things in life that make all the difference, and you have to find the little things that make your days, well, awesome. This entry was posted in Monday's Confessions of an American in Paris and tagged A Christmas Story, americaine à paris, american expat paris, american in paris, baby panda, coconut tree, confetti, cowboy, disco ball, encyclopedia britannica, expat, flags of the world, guilty pleasure, hedgehog, Hugh Hefner, hula hoop, laundry room, Mary Poppins, michelle chmielewski, michmski, mini eiffel tower, Mrs.Field's cookies, my little pony, observing participant, peche mignon, plaisir secret, playdough, power ranger, red bull, Sarah Palin, secret pleasure, sprinkles, Teenage Mutant Ninja Turtles, waffle maker, wash room, washing machine, wok. Bookmark the permalink. Seems you’re now in contention for mak’n me smile . . . smiles are good. Trick is finding something that makes you smile every day! A full nites sleep? AWESOME. Coffee & Tea ‘n those’ll do for me (for now). I live in the South-West, in Périgord since last september And there, from november to february, it’s quite easy to find some not-so-expansive foie-gras. My little guilty pleasure have been to eat a slice of half-cooked foie-gras on a slice of fig bread with a glass of soft Montlouis wine before going to sleep. Wow! Is that a window on the left !!!! That would be my happy place … a laundry room and a window — in Paris. Happy! It would be miracle if the toilet room had a window, too. A permanent place for my yoga mat? Happy. Happy, Happy. This is a short time that I follow your blog and my little guilty pleasure, it’s geeking with my laptop on my stomach, lying on my couch. 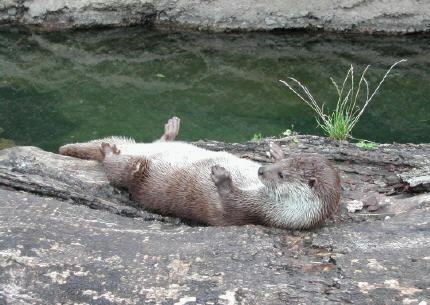 A bit like an otter (like this). I love the background picture 🙂 Is it Lam Hua’s picture ? can’t wait to see your “new project” ! I’ll look at the french version right now.. Turn on my Ipod (in shuffle mode) when i go at work and hear a song i love that i didn’t heard for a while !!! I see so many comments of people saying “you’re not american”. So, can you explain us your roots? You really don’t seem american, you seem polish or portuguese I guess 😛 Your accent is different too. So, are you 100% american? Where does the name Chmielewski come from? I also have my laundry room as my happy place. It is so very good to see that I am not the only one. My guilty pleasure? The Cinema. Especially movies aimed at the teen market that my husband refuses to see. Of course, so that this guilty pleasure is not revealed to all, it is best to select a cinema in a high tourist traffic area. Like the Champs Elysees… late at night. Speaking loudly in English, preferably in an accent other than your own, helps to distract from the reality that you live here. And yes, Glee in 3D was everything I’d hoped it would be! Indeed. Even classy enough I won’t have to go incognito. Mon petit plaisir c’est de parler toute seule dans la rue … en français . Comme j’habite à Londres, personne ne comprend. Je passe pour une folle – mais s’ils comprenaient, je passerais doublement pour une folle. Tu comprends ? Oh by the way I love your videos. The first I watched was “learn French in one word” : putain! it’s my favorite word, how did you guess ??????? ?